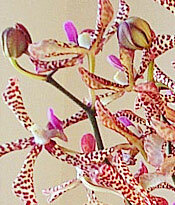 With a great resemblance from Vanda tricolor, many collectors admire Aranda Pata as a single-stem plant. They are collected for its unique color, shapes and patterns. However, the full effect of Aranda Pata is only achieved en masse. 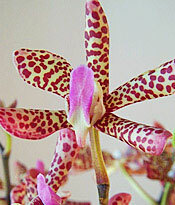 Through Beautiful Orchids, however, it is now possible to imagine the comfort of your home covered by these exotic South East Asian beauties. Exquisite and charming, the flowers can infuse your home with its unique wild berry aroma that is quite recognizable in early evening. The arrangement above was created with 10 stems of freshly cut Aranda Pata in our handblowned, crystal vase. 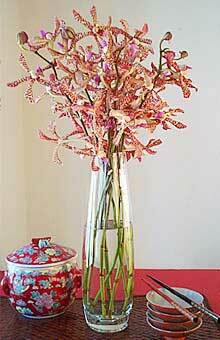 The compact flowers on the stems can be cut down for a collective yet dramatic arrangement. Each purchase includes care instructions and an exquisite gift card for your personal message.